1. Preheat oven to 350˚F. Line a 8”x8” baking pan with parchment and set aside. 2. In a mixing bowl whisk together flour, baking soda, salt, cinnamon, and nutmeg. Set aside. 3. In another mixing bowl, cream together butter and sugars. Add eggs and vanilla and continue to mix together. Scrape down sides of the bowl and add dry ingredients. Stir together until well combined and a dough forms. Fold in oats until fully incorporated. 4. To assemble: Press half of the dough into the bottom of the prepared baking pan. Top with an even layer of 6 ounces of chocolate and top chocolate with an even layer of marshmallows. Carefully press remaining cookie dough over the marshmallows. Sprinkle the remaining chocolate over the top and bake for 32 to 35 minutes or until golden brown. Remove from the oven and allow pan to cool, about 30 minutes. 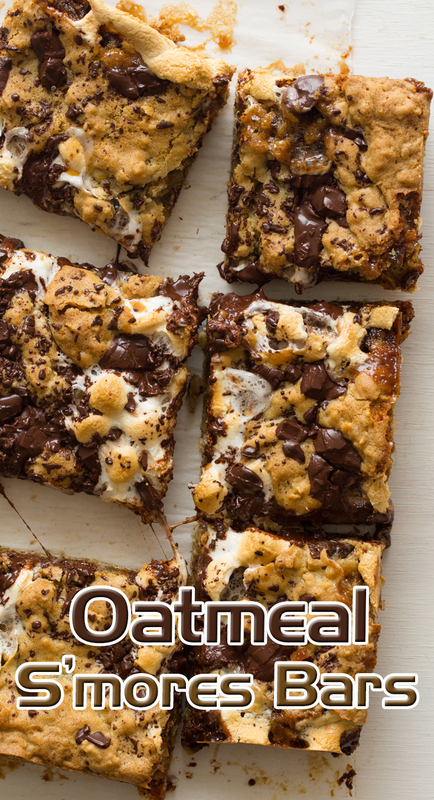 Cut into bars or squares and serve.